For other people named Joseph F. Smith, see Joseph F. Smith (disambiguation). Joseph Fielding Smith Sr. (November 13, 1838 – November 19, 1918) was an American religious leader who served as the sixth president of The Church of Jesus Christ of Latter-day Saints (LDS Church). He was the nephew of Joseph Smith, the founder of the Latter Day Saint movement, and was the last president of the LDS Church to have known him personally. Smith was the son of church patriarch Hyrum Smith and his second wife, Mary Fielding, a British convert to the church who married Hyrum after the death of his first wife, Jerusha Barden Smith (1805–1837). In addition to her two children, Mary also raised the six children born to Hyrum and Jerusha. Smith was born in Far West, Missouri, on November 13, 1838. Just a few days before he was born, his father had been taken prisoner under the auspices of the Missouri Executive Order 44 (infamously called the "extermination order" due to its threat against the lives of Mormons who refused to leave the state after clashes between them and a Missouri militia). At point of bayonet, Hyrum was marched to his home in Far West and ordered to say farewell to his wife. He was told that his "doom was sealed" and that he would never see her again. Hyrum was still in custody in Liberty Jail, Missouri, when Smith was born. He was named after his uncle, Joseph Smith, and his mother's brother, Joseph Fielding. His mother and maternal aunt, Mercy Fielding Thompson, fled with their children to Quincy, Illinois, early in 1839, and they later moved to Nauvoo, Illinois, when the majority of the church's members settled. Hyrum was later released from custody during a transfer from Liberty Jail and joined his family in Nauvoo. Joseph F. Smith stated as an adult that he had memories of Nauvoo, and could recall his Uncle Joseph and events that occurred at his uncle's home; he was nearly six years old when his father and uncle were killed in Carthage, Illinois, on June 27, 1844. Smith's family remained in Nauvoo until September 1846, at which time his mother took their family and fled the city, camping on the west side of the Mississippi River among the trees on its banks, without wagon or tent, while the city was bombarded by mobs. His mother was later able to exchange their property in Illinois for a wagon and team of oxen. Smith and his family, along with many other Latter Day Saints, fled the American Midwest. The seven-year-old Smith drove the team of oxen with his family to the Latter Day Saint encampment at Winter Quarters, Nebraska. While at Winter Quarters, Smith and another boy, Thomas Burdick, were out on horseback some distance from the settlement, watching the cattle graze. They saw a band of twenty or thirty American Indians ride into the valley on the other side of the cattle. Burdick rode back to camp to get help while Smith rode toward the Indians and got between the Indians and the herd before the Indians reached them. Smith was able to turn the herd back toward the settlement, and, coupled with the noise and arrival of the Indians, started a stampede which saved the herd from capture. He was still riding with the herd at full speed when two Indians picked him up off of his horse from either side and dropped him to the ground. A company of men from the encampment then arrived, chased away the fleeing Indians, and recovered the herd, but Smith's horse was stolen. Smith and his family remained at Winter Quarters until the spring of 1848 when Smith drove his mother's wagon across the plains to the Salt Lake Valley. After arriving in the Salt Lake Valley in 1848, Smith's mother worked to raise her own children as well as the children of her husband's first wife. Mary Fielding Smith died in 1852, apparently of pneumonia, leaving Smith an orphan at the age of 13. Smith reported that he was devastated by his mother's death, and relied upon the emotional support and help of Brigham Young and his stepfather, Heber C. Kimball. Even with the support of his older half-brother John Smith, Smith assumed primary responsibility for his young sister, Martha Ann, and subsequently left school in 1854. His leaving school was closely linked to his resistance of a teacher's attempt to whip Martha. At the age of fifteen, Smith was called to go on his first LDS mission to the Sandwich Islands under the direction of apostle Parley P. Pratt. This mission assignment at an unusually young age happened after Smith assaulted a teacher who he felt was unfairly punishing another student; decades later Smith wrote in the LDS publication Improvement Era of the burning rage and explosive temper of his youth which he blamed in part on his reaction to the deaths of his parents. Smith was ordained an elder by George A. Smith on April 24, 1854, and received his endowment at the Endowment House the same day. He then traveled to San Bernardino, California, where he worked to earn money for passage on a ship to San Francisco. In the San Francisco area, possibly in what is now Fremont, California, on the farm of John Horner, he was again employed in agricultural pursuits seeking to earn money for passage to Hawaii. After a difficult period of adjustment to the local culture, Smith successfully learned the Hawaiian language and reported great success in four years of missionary work on the islands. Besides serving with various American companions on his mission, he also had two Hawaiian companions: Paake, who was a property manager for some of Jonathan Napela's property, and Lalawaia. He spent the first part of his mission on Maui, but later presided over groups of branches on the island of Hawaii and then over all LDS Church units on Molokai. Smith was called back to Utah Territory in 1857, largely as a result of the Utah War. He traveled overland from San Francisco to San Bernardino and then north through Las Vegas on his return. He arrived in Utah in February 1858. Shortly after this, Smith joined the territory's militia, named the Nauvoo Legion, and spent several months patrolling the eastern side of the Rocky Mountains. Later in his tour of duty, he served as chaplain of Colonel Heber C. Kimball's regiment, with the rank of captain. After tensions between the church and the federal government abated, Smith assisted his relatives in their return to northern Utah from areas of southern Utah, where they had taken their families for safety. During the 1858–59 session of the Utah territorial legislature, Smith served as the sergeant-at-arms. In 1859, he married his first wife, Levira Smith. In the LDS Church, Smith was ordained a seventy in March 1858 and then a high priest and a member of the Salt Lake Stake high council in October 1858. In 1860, at 22 years of age, Smith was sent on a mission to Great Britain. He and his cousin, Samuel H. B. Smith, drove mule teams over the plains to Winter Quarters to help pay their way. Shortly after arriving in England, Smith was made the conference president in Sheffield. Among the church members in that city was William Fowler; Smith was present at the meeting where Fowler's hymn "We Thank Thee, O God, for a Prophet" was first sung. After a short time, Smith was appointed to the pastorate, an office that existed only in the British Mission for a short time. In this position, he presided over the Sheffield Conference as well as four other adjacent conferences. He served in the British Mission for three years, the last part under mission president George Q. Cannon, when he was sent on short assignments to Denmark and France. Smith left England in June 1863. After a short stay in New York City to earn enough money to return home, he served as the chaplain of a Mormon pioneer wagon company bound for Utah from Nebraska. Smith had only been home for a short while when he was called to accompany Ezra T. Benson, Lorenzo Snow, William W. Cluff, and Alma T. Smith on a mission to the Sandwich Islands to correct the problems in the church caused by Walter M. Gibson. A leader in the LDS population, Gibson eventually provoked ire by preaching controversial doctrine and embezzling funds. Smith acted as principal interpreter for the apostles, and after Gibson was excommunicated, Smith was left in charge of the mission. Smith returned home in the winter of 1864–65. Smith had a notable experience during this mission. The group anchored their boat in a rough channel in order to go ashore, proposing that the party should land using the freight boat. Smith was strongly opposed to this, saying that the boat was unfit for the rough waters and that there was a great danger of capsizing. He offered to go ashore alone to obtain a boat fit to transport the party, to which they refused. They were persistent, however, chiding him for his waywardness, with one leader even saying, "Young man, you would be better to obey counsel." Smith then reiterated his impression of danger, imploring them not to go, but they insisted, so he asked that they leave their satchels, clothes, and valuables and permit him to stay. They reluctantly consented and set out for land. Partway there, the freight boat was overturned by the rough water about 20 or 30 feet deep, and Lorenzo Snow nearly drowned in the ocean. Snow's unconscious body was recovered, and on shore they were able to resuscitate him. Thanks to Smith's actions, all of their belongings were saved. Upon his return home, Smith was employed in the Church Historian's office for a number of years. It was while working in this position he met his second wife, Julina Lambson, who was a niece of Bathsheba W. Smith, a wife of church apostle George A. Smith. Smith also served as a clerk in the Endowment House from the death of Brigham Young until the building was razed in 1890. Smith's latter mission to Hawaii was largely prompted by the fact that Smith held this position: since he had in his possession the records of the Endowment House, Smith could be a valuable witness for the federal government's prosecutions of Mormon polygamists. Smith served seven terms in the Utah territorial House of Representatives, specifically from 1865 to 1870, 1872, and 1874. He was a member of the Salt Lake City Council for many years and in this position was a key advocate of establishing city parks. He was thus one of the people involved with the establishment of Pioneer Park and Liberty Park in Salt Lake City. In 1868 and 1869, Smith served as a member of the Provo City Council. Smith served as a member of the Utah Territorial Council, essentially the equivalent of the upper house of the legislature, in 1880 and 1882. He also served as president of the Utah constitutional convention in 1882. The state constitution produced by this convention did not go into effect because Congress did not vote to grant Utah statehood until 1895. Smith also served as a LDS Church representative on boards of many Utah businesses. On April 5, 1859, Smith married his sixteen-year-old cousin, Levira Annette Clark Smith, daughter of Samuel H. Smith. When Joseph F. Smith left on his mission to England the next year, his companion for the journey was Levira's brother, Samuel. Smith and Levira had no children. Seven years later (1866), Brigham Young directed Smith to take a plural wife. Levira gave her permission and was present at the marriage of Smith and Julina Lambson (who became the mother of future president Joseph Fielding Smith) -- a longtime friend of hers. Levira became disenchanted with the plural marriage arrangement and divorced Smith in 1868 and moved to California. Smith ultimately adopted five children and fathered forty-five children. 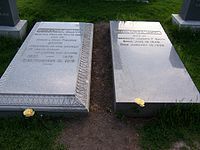 Thirteen of his biological children preceded him in death: Mercy, Leonora, Sarah Ellen, Heber, Rhoda, Alice, Hyrum, Alfred, Albert, Robert, Zina, Ruth, and John. His adopted son Edward also preceded him in death. Julina Lambson (July 18, 1849 – January 10, 1936). Married May 6, 1866. Julina was a nurse and midwife. Sarah Ellen Richards (August 24, 1850 – March 22, 1915). Married on March 1, 1868. Sarah was a daughter of Willard Richards and his wife Sarah Longstroth. Edna Lambson (March 3, 1851 – February 28, 1926). Married on May 5, 1871. She was the sister of Julina Lambson, who was also one of Smith's wives. Alice Ann Kimball (September 6, 1858 – December 19, 1946). Married on December 6, 1883. Alice was Heber C. Kimball's daughter, and the twin of Andrew Kimball, father of Spencer W. Kimball. Mary Taylor Schwartz (April 30, 1865 – December 5, 1956). Married on January 13, 1884. Mary was Agnes Taylor's daughter and church president John Taylor's niece. One of Smith's granddaughters, Amelia Smith, married Bruce R. McConkie, who later became a member of the Quorum of the Twelve Apostles. On July 1, 1866, Smith became a general authority of the LDS Church when he was ordained an apostle by Brigham Young and sustained as a counselor to the First Presidency, where he served until Young's death. However, he was not sustained as a member of the Quorum of the Twelve Apostles until the church's October 1867 conference. On February 28, 1874, Smith left for his second mission to England, serving as president of the European Mission from 1874 to 1875, returning home upon the death of First Presidency member George A. Smith. He was then called to preside over the Davis Stake until he left again in the spring of 1877 for his third mission to England. When news arrived of the death of Young, Smith was released and returned home. The following year, Smith served an Eastern States Mission with Orson Pratt, visiting noteworthy places in the history of the church in Missouri, Ohio, New York and Illinois. During this trip they met with and interviewed David Whitmer. In October 1880, three years after Young's death, Smith was named second counselor in the First Presidency to church president John Taylor, serving from 1880 to 1887. He later served as second counselor to Wilford Woodruff (1889–98), and as second counselor to Lorenzo Snow (1898–1901). Smith was appointed first counselor to Snow on the death of first counselor George Q. Cannon, but, as Snow himself died only four days later, Smith never served in that position. He succeeded Snow as president of the LDS Church and president of the Salt Lake Temple. He served as president of the temple until 1911, when he transferred the responsibility to Anthon H. Lund. Smith also served as editor of the Improvement Era and Juvenile Instructor, and general superintendent of the Sunday School and Young Men's Mutual Improvement Association. Smith felt it was important for Utah to become a state, and thereby eliminate the ongoing federal supervision of Utah Territory. Following the official discontinuance of new plural marriages by Woodruff in 1890, and the dissolution of the Mormon People's Party in 1891, Smith championed the anti-polygamy Republican Party in Utah. After the death of church president Lorenzo Snow, Smith was chosen by the apostles of the church as Snow's successor. Smith was set apart as President of the Church on October 17, 1901, with Presiding Patriarch John Smith acting as voice. This action was ratified by a special conference and solemn assembly of the priesthood on November 10, 1901. He chose John R. Winder and Anthon H. Lund as his counselors. After Winder died, Lund became the first counselor and Smith's second cousin, John Henry Smith, became the second counselor. One of the first issues Smith faced was the ongoing difficulties for the church due to the continuing practice of plural marriage. Smith supported apostle Reed Smoot's candidacy for the U.S. Senate, but Smoot's election was contested on the grounds that he was an officer in a church which continued to countenance polygamous marriages. The Senate investigation again focused national attention on Mormon marriages and political influence. Additional attention was given to Smith because of his opposition to the election and re-election of Utah's senior U.S. Senator, non-Mormon Thomas Kearns. Following his appearance before a Senate panel in 1904, Smith took steps to prevent any surreptitious continuation of church plural marriages. On April 6, 1904, Smith issued the "Second Manifesto", and declared that any church officer who performed a plural marriage, as well as the offending couple, would be excommunicated. He clarified that the church's policy against new plural marriages applied worldwide, and not just in the United States. Two members of the Quorum of the Twelve, John W. Taylor and Matthias F. Cowley, resigned in 1905 following these announcements. Smith, however, continued to live with his plural wives as did other Mormon polygamists. In 1906, Smith was brought to trial on a charge of unlawful cohabitation with four women in addition to his lawful wife; he pleaded guilty and was fined $300, the maximum penalty then permitted under the law. Smith gave more influence to the Presiding Patriarch of the church than had any president since Joseph Smith. The church's presiding patriarch, John Smith, was his elder half-brother. During his presidency, Smith apparently pushed to change the order in which church leaders were sustained in general conferences. He intended to have the presiding patriarch sustained before even himself (as president of the church), consistent with his interpretation of Doctrine and Covenants Section 124 and early historical precedent. This met with opposition from the other apostles, and the proposal was not realized. In 1906, Smith went on a tour to Europe, becoming the first LDS Church president to travel outside of North America during his presidential tenure. In 1908, Smith organized a committee to standardize and reform the Aaronic Priesthood quorums. This committee standardized the age requirements for young men to be ordained to the office of Teacher or Priest. Smith's seventeen-year presidential administration made efforts toward improving the church's damaged relationships with the federal government and related issues dealing with the church's financial situation. The administration acquired historic sites, constructed numerous meetinghouses, and expanded the church system of educational academies and universities. He also oversaw a continued growth in church membership. During Smith's presidential tenure, the LDS Church constructed and dedicated the Joseph Smith Birthplace Memorial near South Royalton, Vermont. It was dedicated by Smith on December 23, 1905, the 100th anniversary of Joseph Smith's birth. Also during Smith's presidency, the Seagull Monument at Temple Square in Salt Lake City was dedicated on October 1, 1913. In 1913, Boy Scouting became the official youth activity program for the church's young men. During much of his presidential tenure, Smith oversaw the planning and construction of the Hawaiian Temple in Laie, Hawaii, one of his part-time residences. Smith died at Salt Lake City on November 19, 1918 during the Influenza Epidemic of that year, a year before the Hawaiian Temple was to be dedicated. Smith left a body of religious writings often used in discussing church doctrine and religious conduct. Smith died of pneumonia resulting from pleurisy in Salt Lake City on November 19, 1918, and was succeeded by Heber J. Grant. Due to the widespread influenza pandemic of 1918–20, a graveside service was held, rather than a public funeral. Smith was interred in the Salt Lake City cemetery on November 22, 1918. "The Origin of Man": In November 1909, in the midst of public interest in theories of evolution, the First Presidency issued a statement that affirmed that God created man in his own image. The document also succinctly reiterates the Mormon doctrine of a twofold creation (spiritual followed by temporal), the premortal existence of man, and ends noting that man, as a child of God, is capable of evolving into a god. "The Father and the Son": On June 20, 1916, the First Presidency and the Quorum of the Twelve Apostles issued a statement examining the Mormon use of the term "Father" in scripture, clarifying times when the word refers to God the Father and when the word refers to Jesus Christ. The statement identified four different uses of the word "Father." God the Father is the literal parent of the spirits of mankind and the earthly father of Jesus Christ. Jesus Christ is referred to as "the Father" when discussing his role as creator of the earth, when he acts as "the Father" of those who abide in his gospel, and when he acts with the authority of his Heavenly Father while on earth. "Vision of the Redemption of the Dead": On October 3, 1918, Smith received a revelation on the nature of the spirit world and on Jesus Christ's role in ensuring that the gospel is taught to all men, living and dead. A written account of the revelation was submitted to the general authorities of the church on October 31, 1918, and was unanimously accepted. The revelation was initially published in December 1918, and was added to the Pearl of Great Price, one of the church's scriptural standard works, in April 1976; it has since been removed from the Pearl of Great Price and added to the Doctrine and Covenants as section 138. This revelation complemented an 1894 statement on the eternal nature of the family and appropriate temple work for the dead issued by Woodruff. Genealogy work by members of the LDS Church increased after both of these statements. Funded by Lorenzo N. Stohl, the sermons and writings of Smith were compiled by John A. Widtsoe, Osborne J. P. Widtsoe, Albert E. Bowen, Franklin S. Harris, and Joseph Quinney. In 1919, the Committee on Study for the Priesthood Quorums of the Church of Jesus Christ of Latter-day Saints had this work published as the book Gospel Doctrine, for use as instruction for Melchizedek priesthood quorums of the church. Smith's teachings as an apostle were the 2000–01 course of study in the LDS Church's Sunday Relief Society and Melchizedek priesthood classes. Smith, Joseph F. (1981). Hyrum M. Smith III and Scott G. Kenney. (ed.). From Prophet to Sons: Advice from Joseph F. Smith to His Missionary Sons. Deseret Book Company. Smith, Joseph F. (1919). Gospel Doctrine: Selections from the Sermons and Writings of Joseph F. Smith. Deseret News Press. Smith, Joseph F. (1998). Teachings of Presidents of the Church: Joseph F. Smith. LDS Church. LDS Church publication number 35744. Parley Parker Christensen, Salt Lake County clerk, delayed prosecution of Smith. ^ Smith was ordained an apostle and added to the First Presidency as a counselor. At the time of his call, there was not a vacancy in the Quorum of the Twelve Apostles or the First Presidency. ^ Smith. Life of Joseph F. Smith, p. 229. ^ Smith. Life of Joseph F. Smith, pp. 164–67. ^ Richard O. Cowan and William E. Homer. California Saints: A 150-Year Legacy in the Golden State (Provo: Religious Studies Center of Brigham Young University, 1996), pp. 144–47. ^ Smith. Joseph F. Smith, pp. 169–87. ^ Smith. Joseph F. Smith, p. 196. ^ Smith. Joseph F. Smith, p. 199. ^ Smith. Joseph F. Smith, pp. 202–05. ^ a b Smith. Life of Joseph F. Smith, p. 230. ^ Smith. Joseph F. Smith, p. 231. ^ Andrew Jenson. LDS Biographical Encyclopedia. Vol. 3, p. 781. ^ a b Bates, Irene M.; Smith, E. Gary (1996). Lost legacy: The Mormon office of presiding patriarch (1 ed.). Champaign, IL: University of Illinois Press. ISBN 0252021630. ^ O. N. Malmquist, The First 100 Years: A History of the Salt Lake Tribune, Utah State Historical Society, 1971. ^ Deseret Evening News, November 23, 1906; Salt Lake Tribune, November 24, 1906. ^ Hartley, William (1973). "The Priesthood Reform Movement, 1908-1922". Brigham Young University Studies. 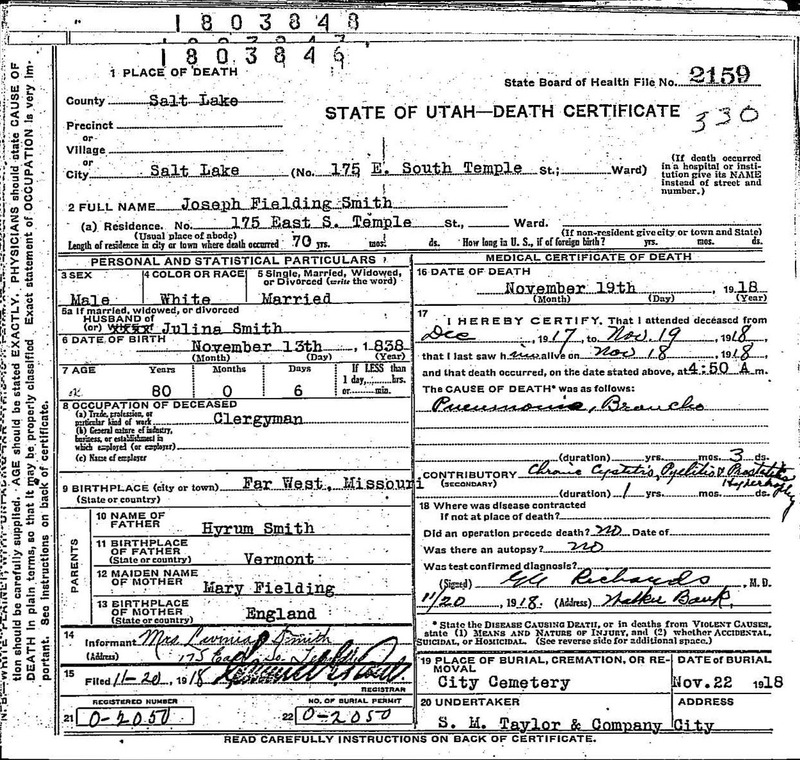 ^ State of Utah Death Certificate Archived 2009-03-26 at the Wayback Machine. Allen, James B. and Leonard, Glen M. The Story of the Latter-day Saints. Deseret Book, Salt Lake City, Utah, 1976. ISBN 0-87747-594-6. Ludlow, Daniel H., Editor. Church History, Selections from the Encyclopedia of Mormonism. Deseret Book, Salt Lake City, Utah, 1992. ISBN 0-87579-924-8. Nibley, Preston. The Presidents of the Church Deseret Book, Salt Lake City, Utah, 1974. ISBN 0-87747-414-1. Smith, Joseph F. Gospel Doctrine Deseret Book, Salt Lake City, Utah, 1977. ISBN 0-87747-663-2. Smith, Joseph Fielding. 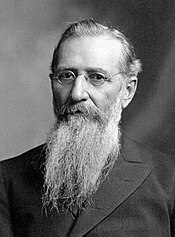 Life of Joseph F. Smith, Sixth President of The Church of Jesus Christ of Latter-day Saints. Deseret News Press, 1938.